I will be the first to admit that Ella Enchanted is probably in my top five favorite books. You can laugh if you want that I love a book written for preteens, but Ella Enchanted is a magical fairytale that is rarely matched these days. 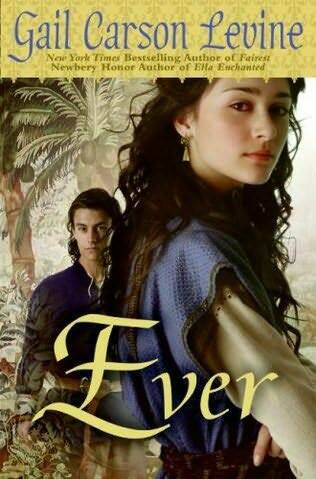 With my love of Ella Enchanted in mind, I have gradually worked my way through almost all of Gail Carson Levine’s other work. Some I have like and others I have raised an eyebrow at, but nothing has compared to Ella Enchanted. Because of this, I wasn’t expecting a whole lot when I picked up Ever, so it amazed me that even with my low expectations, I was completely disappointed. Ever is the type of book I expect out of an inexperienced author, not one that has published so many books. The characters lacked depth and honestly the were so few intelligent thoughts made by any of the characters that I worried for them a little. Levine loves to use some interesting names in her works but the names in this book were harder to remember than most. The basic story involves a girl named Kezi. Kezi’s mother falls ill and her father promises his God that he will sacrifice the first person to meet a certain criteria. Kezi ends up being that person and is given thirty days to live before she will be sacrificed to the Gods. In that short span of time, Kezi means Olus and falls in love and the two spend the thirty days trying to save Kezi from being sacrificed. This book was pretty original and an easy read (except for the names). It is pretty entertaining but it is definitely nowhere near Levine’s best work. From another author I may have liked this book better, but as it stands now, I will probably never read it again and for me, that is saying something.